Jim Shaughnessy of the Irish Voice writes about a celebrated figure who advanced the cause of Ireland and the cause of equality for women. The struggle for universal suffrage in Ireland was a long one, finally coming to an end in 1922 when women were given the right to vote in elections in the Irish Free State. Key to this voting equality was the courage and tireless hard work of suffragettes like Hanna Sheehy-Skeffington, who devoted most of her life to campaigning for the rights of women and Ireland’s independence. A dedicated campaigner, Sheehy-Skeffington also travelled to the US to spread her political messages. Born in County Cork in 1877 into a family with strong political convictions - Hanna’s father David was MP for South Galway, and her uncle Eugene was known as the ‘Land League Priest’ - Hanna quickly developed into an excellent student, thriving at school before graduating with a BA, then a first class honours MA from the Royal University of Ireland. In 1903, Hanna married Francis Skeffington. The couple’s convictions surrounding equality led Francis to take Hanna’s name, making them Hanna and Francis Sheehy-Skeffington. This commitment to equality was a strong bond between the two, and within five years of their marriage they were instrumental in the creation of the Irish Women’s Franchise League and the organisation’s newspaper, the Irish Citizen. Hanna’s campaigning was relentless. 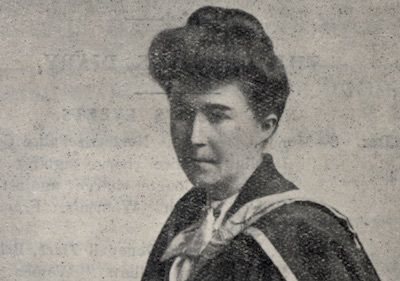 In 1913 she was sent to prison for the first time, on this occasion for throwing stones at Dublin Castle as part of a protest, something that cost her her job as a teacher. Once out of work, Hanna could devote more of her time to women’s suffrage, writing articles on education and feminism and protesting against the conscription of Irish men to fight in the First World War. In 1916, during the Easter Uprising, Francis was shot dead by British soldiers despite not being involved in any fighting. Hanna declined the compensation offered by the British and demanded an inquiry into Francis’ death. This was duly held, with the officer responsible escaping punishment. At the end of 1916, Hanna came to America to travel around the nation delivering a talk titled ‘British Militarism as I Have Known It.’ This tour raised $40,000, which she donated to the cause of Irish independence. The pamphlet that was made of her talk was banned in Britain until after the end of the war. Hanna spent over a year touring America and delivering her message before sailing to Liverpool in 1918. Prohibited from returning to Ireland, Hanna snuck back into the country before getting caught and sent to Holloway Prison under the Defence of The Realm Act, where she went on hunger strike and was released. 1922 saw America play a part in Hanna’s story once again, as she was sent by Eamon de Valera to tour 25 states, raising funds for the American Committee of Irish Republican Soldiers and Prisoners’ Dependents Fund. Hanna’s campaigning continued throughout her life; she spent time as assistant editor of a Sinn Fein newspaper, continued to deliver speeches in Ireland, Canada and the United States and made her living as a journalist, writing about independence, suffrage and feminism. In 1946, Hanna died, leaving a legacy of sacrifice, bravery and a list of achievements befitting of a true Irish hero.